Most of these little 'structures of necessity' were gone by the 1950s. But at one time they were common, though not notable. 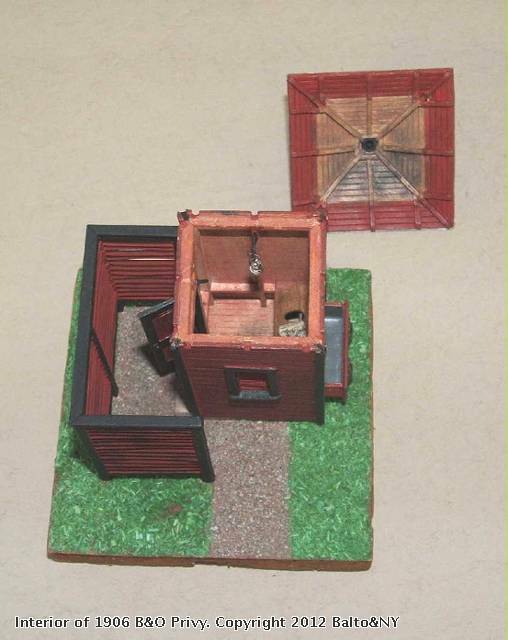 The B&O railroad designed this two-holer to accompany small stations lacking indoor plumbing, as well as for isolated towers along the line. The building measures 4' x 4' (1" x 1" in O scale). It's built in wood, following a B&O 1906 drawing. The privacy fence was done in styrene with individual slats. 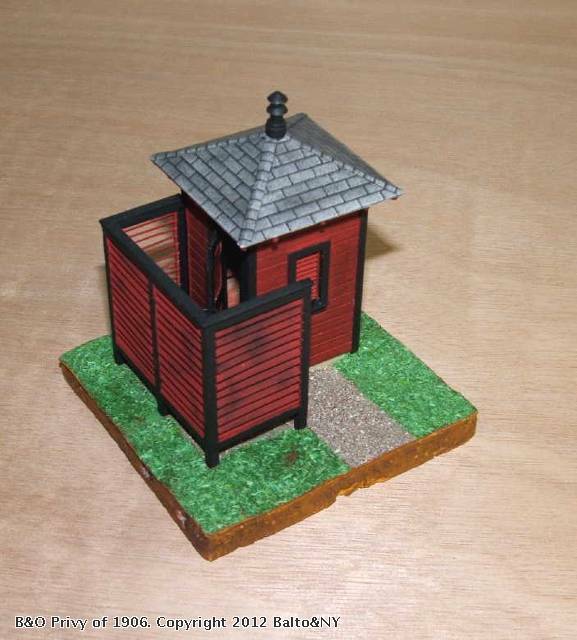 The privy is mounted on a piece of foamcore board with a concrete foundation modeled in wood and painted. Real screened locotmoive cinders were used under the privy. The ground surface is detailed with dyed sawdust for grass and screened concrete driveway sweepings for a gravel walk. The structure was lightly weathereed and begrimed with chalks. In a finished scene it would be set off to one side of the property in modest seclusion but not far from a depot's waiting room. The interior is fully detailed, including a coat hook and bracket for a lantern used for night time visits by passengers or staff. If vacant, the lantern would be hung on the entry end of the privacy fence by tne walkway. The door can be opened and shut. The removable waste box is lined with sheet zinc, like the prototype. It's from a 1950s offset press master. No telling where the agent emptied that box but it probably wasn't all that far away! A Sears catalog is handy inside and there's also a hornets nest, So anyone using it won't tarry long. Actually, it's a tiny blob of glue in one corner. This model was specifically built for a contest sponsored by the B&O Railroad Historical Society several years ago. 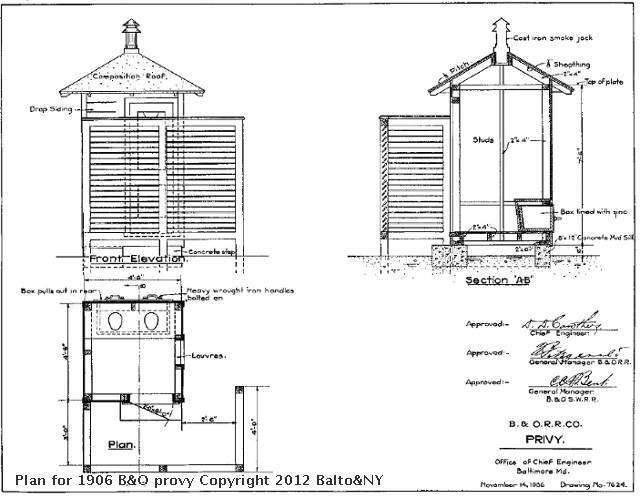 Below is the 1906 drawing for this B&O privy. Plans like these were done for many B&O structures including depots, freight houses, towers, passenger shelters and track-side maintenance of way buildings. When constructing such buildings in the field, simple drawings like these were used. Building crews knew how to construct and finish these wood frame buildings to Company standards without the need for elaborate, detailed drawings. They could also change a structure's orientation on the site such as swapping the left side for the right. The materials needed would have been dumped off a freight car in advance at a specified location. Within a few days to a week or two (depending on the size of a structure) it would be up and ready for the finishing painters and shortly later on, the electricians. Sorry about the plan caption's typo! Once put in, it can't be corrected.